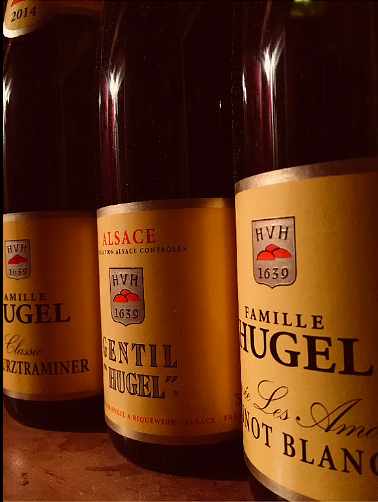 Though completely unfamiliar with this producer and only having a passing acquaintance with the wines of Alsace, I was eager to taste through these wines and learn a thing or two. That said, almost without exception and despite limited exposure, this region has been a consistent source of terrific quality at value prices for white wines. When the email arrived asking if I'd be interested in reviewing some samples in honor of National Hugel Day on November 4 (wait, a winery has it's own day?! ), I jumped at the chance. What do we know about the Hugels? Well, they are not the new kids on the block, that's for sure. Currently in its thirteenth generation of operation, the family combines over 350 years of winemaking experience with modern approaches to marketing. Check out those labels! Old school! Anyway, these were a treat to taste through as they're a departure from what is typically promoted in domestic markets. They're also very versatile wines that would complement your Thanksgiving table nicely. Enjoy. Platinum blonde in the glass with a clean nose. The mouth delivers honeysuckle, steel, wet rocks, and white flowers with seamlessly-integrated acidity. Fruity in the middle, and otherwise dry with a medium long finish. this kitchen sink blend of noble grapes is not too serious, nor is it trying to be, either. Very versatile profile that make this ideal for a wide range of cuisine and conversation. Think anything from Thai to Thanksgiving. The similarities between this and a young cava go well beyond the slight shade - aromas border on austere (relenting a bit as it warms) and lead into a decidedly disciplined structure that brings orderliness to the tension and grip. A damn fine ride for the money. Pretty pale straw in the glass, but appearances are the only restrained aspect of this wine. Powerful aromatics channel strong wet flowers, talcum powder, and industrial lubricant. These carry through to the palate where a wine nerd’s paradise of juxtapositions awaits. Metallic framework holds the ample, soft fruit and acidity in check while your mouth delights in attempting to decipher myriad flavors. An important note: revisited after a few days, the harder edged elements had softened considerably and merged beautifully into the remainder of the wine's fabric. I take this as a positive sign for its longevity and improvement therein.